After working nonstop for the past few years, Vic Chou (周渝民) could now finally take a break to hang out with his family. The Flame’s Daughter <烈火如歌> actor was recently spotted back in his home country of Taiwan, where he seen taking his wife, actress Reen Yu (喻虹淵), their 2-year-old daughter, and a male friend to the zoo. It was an uncrowded weekday (January 9) – the perfect time for celebrity families like the Chous to go on a family date. At the zoo all day, Vic and his family did not leave the park until around 5 p.m. Their daughter was already fast asleep as they took their stroll back to their car in the parking lot. The couple chatted as they walked, with Vic hanging his arm around Reen’s shoulders. Vic and Reen married in 2015, and their daughter was born the following year. The couple maintain a private life, as Vic has expressed his wishes of keeping his daughter as far away as possible from the public eye. He once said, “If it’s possible, I would like my daughter’s face to never show up in the media.” Reen has also retired from the entertainment industry, as she wants to dedicate her time to raising her daughter. 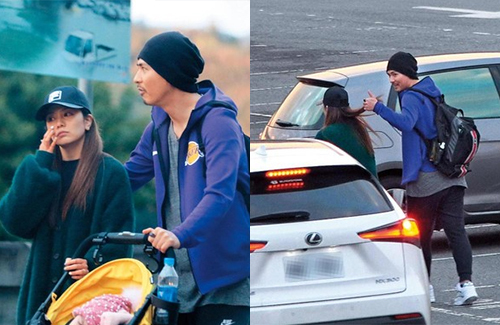 This zoo outing is the first time, since their marriage, where Vic was spotted with his family together.